In this article, we highlight the 20 best online schools for cyber security degrees in 2017. The United States Bureau of Labor Statistics (BLS) indicates that the job outlook for information security analysts is highly favorable over the next ten years. In fact, employment is projected to increase by 18 percent until 2024, a much more rapid increase as compared to other occupations. Entry-level jobs in information and cyber security require at least a bachelor’s degree. By earning a bachelor’s in cyber security, or closely related degree, you make yourself marketable to employers. Due to the expected increase in demand for these types of jobs, accredited colleges and universities are offering online options. This means that students won’t have to sacrifice responsibilities by returning to school. Online cyber security schools have increased in number and are now more accessible to working students. We examined approximately 120 accredited colleges and universities that offer online bachelor’s in cyber security or closely related majors like network security or information assurance. For this list of schools, we looked at the percentage of applicants admitted, overall graduation rates, undergraduate tuition/fees, and student-to-faculty ratios. Our data was taken from the most recent information published by the National Center for Education Statistics (NCES) College Navigator. We used this information to develop our list of the 20 best online schools for cyber security degrees. We used specific methodology and generated our own point system. In the event of a tie, the institution with the lowest tuition was awarded a higher ranking. Our methodology is listed below. From cyberlaw to information assurance–Southern New Hampshire University offers studies for those interested in attending a top online school for cyber security. One of the best online schools for cyber security is Southern New Hampshire University. The school offers in-state tuition to residents who qualify, and has one of the highest graduation rates on our list. The BS in information technologies program has a cyber security option for those who want to specialize in this area of interest. All courses are delivered online and include advanced information systems design, cyberlaw and ethics, cyber security and information assurance, database design and management, human factors in information technology, network security, and security principles. Southern New Hampshire is ranked by major publications like U.S. News and World Report as a top regional university in the North and the #1 most innovative school in the country. Regent University is one of the best online schools for cyber security on our list. One of the best online cyber security schools on our list is Regent University. The institution offers a bachelor’s in cyber security degree that can be completed entirely online. A total of 120 credit hours must be satisfied, with 24 information systems credits and 24 cyber security credits. Cyber security courses include contingency planning and disaster recovery, digital forensics, domestic and international terrorism, homeland security, management of information security, network defense and security, and systems security. Regent offers reasonable undergraduate tuition rates for in-state students and a moderately high graduation rate. U.S. News and World Report ranks the institution as a top national university, and the school’s online bachelor’s programs rank #17 out of more than 1,200 surveyed programs. Ranked by major publications! University of Maryland earns a spot on our list of top online cyber security schools. The University of Maryland University College is one of our top picks for cyber security schools online. Students may earn a bachelor’s in computer networks and cybersecurity entirely online by taking a series of courses delivered by university professors with years of experience. Online courses include ethical hacking, fundamentals of computer troubleshooting, fundamentals of networking, network forensics, and network security. The school is ranked by major publications like U.S. News and World Report as a best regional university in the North. We list it as one of the best online cyber security schools primarily due to its affordable in-state tuition. Bellevue University’s affordable tuition earns it a top spot on our list of online schools for cyber security. Bellevue University is one of our top picks for online schools for cyber security primarily because of the low cost for in-state residents. The school offers affordable tuition and a flexible online bachelor’s in cybersecurity. This completely online program is designed to train students to become experts in this highly skilled field. All courses are delivered online and include assessments and audits, cyber investigations and forensics, introduction to cyber threats and technologies, network security, and securing access control. Bellevue is ranked by U.S. News and World Report as a best regional university in the Midwest. Also, the school’s online bachelor’s programs rank #72 out of more than 1,200 surveyed programs in the most recent edition of Best Colleges. Specialize in security! Western Governors University is one of the best online schools for cyber security on our list. The extremely affordable tuition offered by Western Governors University earns it a spot on our list of the best cyber security schools online. Undergraduate students may major in information technology with a specialization in security. The program is offered entirely online and designed to provide convenient learning options to busy students. According to the program website, students should plan to spend approximately 15 hours per week on their studies. Online courses include data management, information technology fundamentals, network and security, networks, and technical writing. Western Governors has earned recognition in recent years from major publications like U.S. News and World Report as a best regional university in the West. Utica College’s high graduation rate earns it a spot on our list of best online schools for cyber security. Utica College is one of our top picks for online cyber security schools due to the low student-to-faculty ratio and moderately high graduation rate. Utica is one of the few schools in the United States to offer a bachelor’s in cyber security entirely online. Also, several specializations are offered so that students may tailor their degree to suit career goals or personal interests. Specializations include cybercrime and fraud investigation, cyber operations, homeland security and emergency management, information assurance, and network forensics and intrusion investigation. Utica is ranked by major publications like U.S. News and World Report and is one of our best online cyber security schools. BS in Cybersecurity! Saint Leo University is a top choice for online schools for cyber security. Saint Leo University is one of our top choices for online schools for cyber security degree programs primarily due to a low student-to-faculty ratio and affordability. While not the cheapest program on our list, the school offers reasonable in-state tuition and fees. Also, the institution has a relatively high graduation rate. Saint Leo’s BS in cybersecurity can be earned entirely online with classes taught by university professors. Some of the undergraduate courses that can be taken online include computer forensics, disaster recovery, homeland defense, and principles of cybersecurity. Saint Leo is ranked by U.S. News and World Report as the 62nd best regional university in the South and is one of our top picks for cyber security schools online. National University’s affordable tuition helps earn it a spot on our list of online cyber security schools. National University is listed among our top choices for cyber security schools online because of the low student-to-faculty ratio and moderately high graduation rate. National University is also ranked by U.S. News and World Report as a best regional university in the West, and the school’s online bachelor’s programs are ranked #114 out of more than 1,200 surveyed programs. The bachelor’s in information technology management program is designed to prepare students for enrollment in cyber security and information assurance master’s programs. All classes are delivered online and include information security management, information security technology, information technology, IT project management, and local area networks. Upper level division classes may also be taken so that students can tailor their degree towards cyber security and systems management. Franklin University is a top pick for online cyber security schools. Franklin University is one of the more affordable online cyber security schools on our list. We selected Franklin due to its affordable undergraduate tuition and low student-to-faculty ratio. Undergraduates can major in cyber security and take courses entirely online. All classes are taught by university faculty members with relevant and practical cyber security experience. Required classes may include disaster recovery, network security, risk management, security architecture, security law and compliance, and web application security. Franklin University is ranked by major publications like U.S. News and World Report. In fact, the school’s online bachelor’s programs are ranked #106 out of more than 1,200 surveyed programs. Accredited, ranked, and affordable! University of Maine at Augusta is one of the best online schools for cyber security on our list. The University of Maine at Augusta is among our top online cyber security schools due to the affordable undergraduate tuition price tag and moderately low student-to-faculty ratio. Students may earn a bachelor’s in cybersecurity completely online, with courses taught by professors who regularly instruct on the Augusta campus. Online courses include computer network operations, information assurance, intelligence missions, and network security. The program is designed for individuals who desire to work in the every-evolving industry of cyber security. Major publications like U.S. News and World Report rank the institution as a best regional college in the North. Also, the school’s online bachelor’s programs are ranked #30 out of more than 1,200 surveyed programs. Affordability earns Kennesaw State University a top spot on our list of best online schools for cyber security. Kennesaw State University lands a #10 spot on our list of accredited cyber security schools online due to its affordable undergraduate tuition and moderately high graduation rate. The school is also ranked by major publications like U.S. News and World Report as a best national university. Also, the online bachelor’s programs like the online bachelor’s in information security and assurance ranks #143 out of more than 1,200 surveyed programs in the most recent edition of Best Colleges. Students take online courses that include client systems security, cyber defense, network security, principles of information security, and server systems security. All courses are delivered online and taught by the same professors who teach on campus. Norwich University is one of our top online schools for cyber security due to its low student-to-faculty ratio. Norwich University is one of our top online cyber security schools due to its high graduation rate and low student-to-faculty ratio. The institution is also ranked by major publications like Forbes magazine and U.S. News and World Report. In fact, the most recent edition of Best Colleges lists the school’s online bachelor’s programs #72 out of more than 1,200 surveyed programs. Students majoring in cyber security at Norwich can take online courses taught by the same university professors who teach on campus. Also, the undergraduate degree is designed for working adults with career advancement aspirations. Students may tailor their degree by choosing a concentration in computer forensics, information warfare, security management, and vulnerability management. Robert Morris University is a top choice for online schools for cyber security. One of the best online cyber security schools on our list is Robert Morris University. The program offers a low student-to-faculty ratio and high graduation rate. Robert Morris is also ranked by major publications like U.S. News and World Report as the 188th best national university in the country. Undergraduates may earn a BS in cyber forensics and information security without attending classes in a traditional setting. All courses are delivered online and include cyberlaw, digital evidence analysis, IT governance, IT security, mobile forensics, and network forensics. Each year students are required to attend a two-week seminar on national security in Washington, DC. The seminar is designed to provide students with hands-on experience in cybersecurity. The low student-to-faculty ratio at Davenport University helps earn it a spot on our list of best online schools for cyber security. Davenport University is one of our top online cyber security schools due to the low student-to-faculty ratio, moderately low undergraduate tuition, and graduation rate. Students may complete a bachelor’s in cyber defense entirely online through a program recognized by the Committee on National Security Systems, National Security Agency, and the Department of Homeland Security. Online courses include database design, microcomputer applications, privacy and security in health information management, and security foundations or implementing network security. Davenport is also ranked by major publications like U.S. News and World Report as a best regional university in the Midwest. The school’s online bachelor’s programs rank #180 out of more than 1,200 surveyed programs. Penn State’s affordable tuition and graduation rate help place it in the top 10 best online schools for cyber security. Pennsylvania State University is one of our top online cyber security schools due to various factors like low undergraduate tuition, relatively high graduation rate, and favorably low student-to-faculty ratio. The university is also ranked by major publications like U.S. News and World Report as the 50th best national university and 14th top public school. Students can major in information and cyber security and complete courses entirely online. Successful completion of the requirements earns a bachelor’s in information and cyber security. Online courses are taught by the same professors who teach on campus. These courses include computer and cyber forensics, information security management, networking and telecommunications, and network security. University of Illinois earns a top 5 position on our list of online cyber security schools. One of the most affordable online schools for cyber security on our list is the University of Illinois. Due to the affordable in-state undergraduate tuition and low student-to-faculty ratio, University of Illinois is one of the top online cyber security schools on our list. Students can earn a bachelor’s in information systems security with curriculum that is certified by the Committee of National Security Systems and the National Security Agency. All classes are delivered online and include foundations of network security and information assurance, systems programming languages, and systems security and information assurance. University of Illinois is ranked by major publications like U.S. News and World Report as the 63rd best regional university in the Midwest and 13th top public school. Also, in the most recent edition of Best Colleges, the online bachelor’s programs rank #30 out of more than 1,200 surveyed programs. Colorado Tech is one of the top online schools for cyber security on our list. Colorado Technical University is on our list of online cyber security schools due to its affordable undergraduate tuition, low student-to-faculty ratio, and high graduation rate. The school offers a bachelor’s in cyber security that is also ranked by U.S. News and World Report as among the 63rd best online bachelor’s programs in the country. The program is offered entirely online with classes taught by university professors. Classes include computer forensics, principles of network security, security compliance, software assurance, and vulnerability assessment and management. There are also two concentrations available for students who want to focus their study on either computer systems security or information assurance. Colorado Tech is one of the best online cyber security schools on our list. Ranked and accredited! Dakota State University is a top choice for online schools for cyber security. Dakota State University is listed as one of our top online cyber security schools due to its low undergraduate tuition, moderately low student-to-faculty ratio, and high graduation rate. Students may major in cyber operations and earn a bachelor’s in this highly specific field of study. All classes are administered online and taught by the same university professors who teach on campus. Also, the program is one of thirteen in the nation that have received designation from the Center of Academic Excellence in Cyber Operations. Online courses include database management systems, defensive network security, offensive network security, operating environments, reverse engineering, and web software security. Dakota State is ranked by U.S. News and World Report as the 32nd top public school and 108th best regional university in the Midwest. American Public University’s highly affordable undergrad tuition earns it a top spot on our list of best online schools for cyber security. American Public University is one of the top online schools for cyber security on our list. APU offers a low student-to-faculty ratio, a high graduation rate, and highly affordable undergraduate tuition. Students can earn an online bachelor’s in cybersecurity degree that is designed to gain competencies for work as cybersecurity forensic specialists, security auditors, or security managers. All courses are delivered online and taught by experienced professors. Online courses include cyber intelligence, cyber operations, network security, and security architecture. American Public University is ranked by major publications like U.S. News and World Report as a best regional university in the South. Also, the school’s online bachelor’s programs rank #58 out of more than 1,200 surveyed programs. 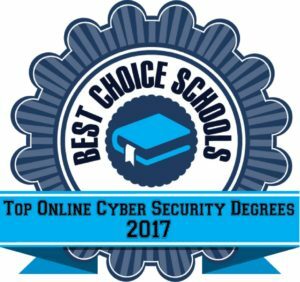 University of West Florida is our #1 pick for top online schools for cyber security. Our #1 pick for online schools for cyber security degree programs is University of West Florida. We selected this institution for best online cyber security schools due to the highly affordable undergraduate tuition, relatively high graduation rate, and selectivity for admission to the school. Also, University of West Florida is ranked by U.S. News and World Report as a best national university, and its online bachelor’s programs are also listed #212 out of more than 1,200 surveyed programs. The bachelor’s in cyber security program is designed to provide flexible education for busy and working individuals. Also, the degree is designed to prepare students for entry into graduate cyber security programs. All courses are delivered online and include ethical hacking, information security management, secure software development, and systems and network security. 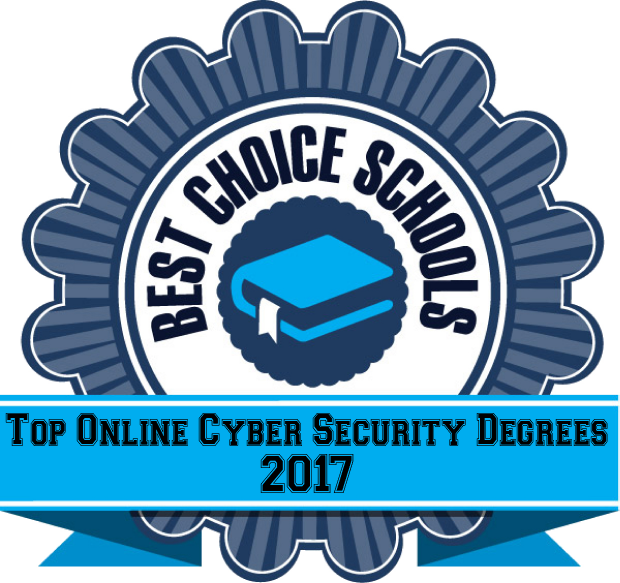 This article highlighted the 20 best online schools for cyber security degrees in 2017.